Christophe Hoppé is the founder of Bausele an Australian designed, Swiss made premium watch company. Born in France and raised in Saudi Arabia Christophe started his professional career as an auditor and consultant for PWC in Luxembourg and Switzerland. He took his first job in watch-making industry as Group CFO for TechnoMarine based in Geneva – Switzerland. Being second in charge at the age of 28 was a great learning experience that allowed him to be involved in a lot of different aspects of the business and opened his eyes to the watch-making industry in Switzerland and Asia. You can’t do anything alone, so first you need to find good partners that will be able to help you implementing any ideas. He then started his own company in Hong Kong and Switzerland, manufacturing watch components for customers in Switzerland. Alexandra – his wife, was an Australian professional contemporary dancer working in Basel, Switzerland and it wasn’t easy to live apart. It was at this point that he decided to sell 50% of his shares in this successful company and move back to Switzerland taking the CFO position at Universo, part of the Swatch Group which employs 500 people manufacturing watches in various locations in Switzerland and abroad. But the entrepreneurial bug had bitten and, after moving to Sydney in January 2010, Christoph wanted to develop his own brand based on an original concept and BAUSELE was born! Combining the fundamental energy and diversity of Australian elements, innovation and style, Bausele is the first premium, Australian designed watch range to be made in Switzerland – the home of watchmaking for generations. Short for ‘beyond Australian elements’, each Bausele watch has elements of Australia in its crown: red earth, coal or beach sand. The idea of BAUSELE came to me at the start of 2010 when I moved to Australia from Switzerland. I was looking for an interesting and different concept/DNA for a watch brand for some time and Australia gave me that inspiration. We launched the company with my business partner here in Sydney in 2011 and received the first watches at the end of 2011. Bausele makes money by selling watches to the end user and also as premium corporate gifts. For this first collection we have mainly a web-based business model. The watches are half the retail price of similar watches with the same movement and quality from other brands. Bausele doesn’t have the well-known brand name that sells by itself for now. We need to build that brand awareness. We are the official time keeper and partner of Yachting Australia! We are also partners of the Middle Harbour Yachting Club in Sydney, the Australian American association based in NYC… to name a few. We also have high profile ambassadors representing the brand such as Adrian “Ace” Buchan – one of Australia’s best pro surfers, Rachel Neylan – Vice World Cyclist Champion in 2012 and Ros Lawrence – Extreme kayaker to name a few. Also our prices are extremely competitive and selling online gives us the opportunity to keep a maximum of the margin to invest in the development of the brand. We sell our watches through our online store and deliver anywhere in the world for free thanks to our logistic platform based in Hong Kong. Nevertheless we have a few selected stores selling our range around Sydney and we just opened in Indonesia with a great partner that sells our watches in 15 stores throughout Indonesia. We’re also starting in the US with 2 new stores in Los Angeles. Very exciting! Also, the corporate side of the business is growing a lot for Bausele. We are working with different companies that would like to create their own watches as corporate gifts for special events or to be sold as additional products that tell the company story. Recently an Australian institution ordered watches to give as a present to their VIP’s visiting Australia. No one offers to actually carry a piece of Australia with you in a premium product like my watches. There is a lot going at the moment. I guess the main one is getting ready for Christmas. Christmas is an important selling period for watches and it starts now to get the word out that there is a really cool Australian watch brand that you should consider when buying that special present for someone. We just received the sample of our new automatic models. The watch is very different and powered with 2 very good and reliable movements to reach 2 different price points (below $1,000 and below $1,500 respectively). The photo shoot has been done (see below) and we are soon to put them online to offer as pre order to our customers at an advantageous pricing. They are limited editions and soon to be collectable so don’t miss out. Also, we have arrived at that stage of development for Bausele where we need some funding to take advantage of all the extremely positive energy and opportunities of the moment. We are in contact with PWC who will help us to put Bausele in front of the right investors. You can’t do anything alone, so first you need to find good partners that will be able to help you implementing any ideas. A lot of persuasion, commitment and work and you should be able to make that idea happen! It is important to do something every day to keep the brand/company moving forward. Similarly with all actions taken to get the brand progressing, some investments don’t bring any return and some may take six months to provide the return. Keep on trying and there is no bad or stupid idea. I wake up very early to reply to emails, before going for a run to get my energy for the day working at Hurley. I come home every evening to spend some time with my two kids. I always put them in bed every night without fail – it is the most important part of the day for me! After putting the children to sleep we cook and eat with my very supportive wife Alexandra before returning to my desk to start to work on Bausele again. I only do the administrative aspect during that time. The creativity with marketing and brand design is non-stop – while driving, on the bus, eating lunch, at the beach, or running. I am convinced I wouldn’t have been able to successfully launch my own watch brand with limited amount of capital anywhere else in the world. Australia is the concept of Bausele, Australians are proud and support products coming out of Australia. In the case of Bausele the watches are designed in Australia and Swiss Made. Also, I found the business networks are easy accessible. I didn’t know anyone in the business world before moving to Australia. Sydney has been an amazing city to start a business, people are open minded and willing to help and support a good idea to grow. Sydney needs a good car sharing website. How many people are living in the same suburbs and go to work in the CBD? They could all share a car, save money and the environment. If you observe the traffic in Sydney, it is one person for one car all stuck in traffic jams at peak hours…unbelievable! Eva Leube – real handmade watch making based in Manly beach, Australia. We have the same passion for the industry and I admire what she is doing. Orange Watch Company – Dan makes internationally well respected diving watches out of Orange, NSW! Omega – the best quality for value in the industry. 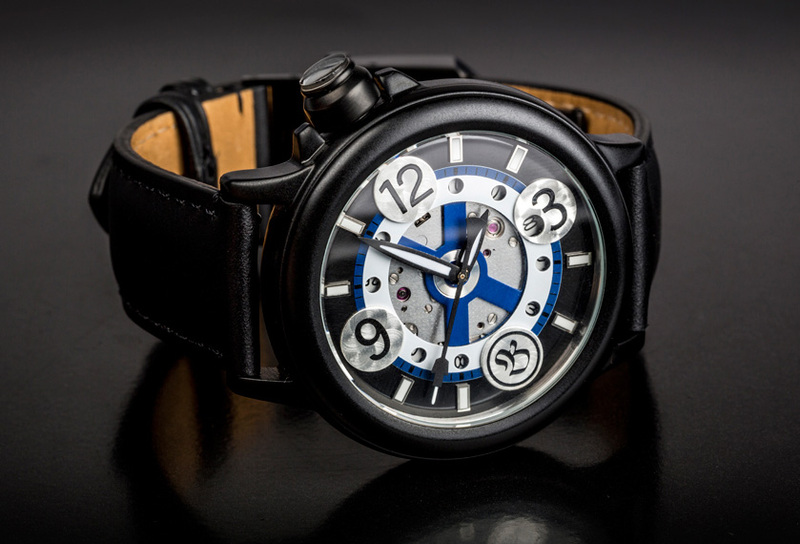 MB&F – great designs and thinking outside of the box. Hublot – master in marketing. It can create a way for like minded people to express themselves around a project they believe in, where they can fully express their creativity and who they are without boundaries, supporting the less fortunate with the profit generated from that enterprise. I guess we are making consumable goods with Bausele. I make sure we select the best suppliers to work with and try to be as sustainable as I can be in my life in general. Yes, I would like to support Surfrider Foundation for what they are doing in protecting waves and beaches, our best playground! Sportaroo – a crowd funding website to support your passion for sport by helping athletes competing in less highlighted sports to achieve their goals. Etsy – a cool store to shop for products that are different and support directly the person making it. Humans of New York – a good representation that we cannot judge a book by its cover. We are all having different journeys that made us who we are and brought us to where we are. @acebuchan – our lucky brand ambassador traveling the world surfing and visiting the best spots in the world. He shares some great pictures and thoughts of his travels and make me travel with him. @horologium – the Sydney based watch lover / blogger sharing her love of the watch industry. I like the idea of selling my watches in pop up stores and small boutique / designer galleries around Australia. Anyone interested? Being a French national, I like my crepes. There is a good “Creperie” that opened in Mosman (Sydney north shore) called The Four Frogs. They make good crepes and I love the name of the restaurant. For sure, how about the winner gets a Vintage watch? She/He can choose between the black version with the coal from Newcastle in the crown, the red face with Red Earth from the outback or the beige with sand from Bondi! Get serious about making ideas happen!